"I want whoever's going to make this a winning team. Right now, Freddy is my second baseman, in my mind. He's the guy I can trust to go 100 percent and get the job done. Castillo's got to show me something. You're going to see it in spring training. If he's slimmed down and ready to work, he's going to have a good year. But, if it's the other way around, we're going to have some problems." I think that, as a veteran and leader of the team, this is something that Jack should have taken to Castillo in private and kept out of the media. That being said, I do not have a huge problem with these comments. Castillo arrived to camp last spring overweight and then went on to spend an entire season making mental mistakes in the field and showing a complete lack of focus at the plate. Something tells me that Jack may have already talked to Castillo in the past and nothing came of it. While I do not agree with Ron Cook's statement in this article that Wilson deserves the Dapper Dan award for this comments*, I do believe that this team desperately needs some emotion. There should be some pissed off people in that locker room that are tired of losing, and someone needs to take charge and make sure everyone on the team knows that failure will no longer be accepted. It is true that Jack isn't good enough of a player to call a teammate out for lack of production. 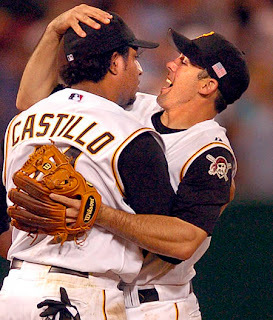 But he is one of the more experienced guys on the team and he puts everything he has into helping the Pirates win. I would say that he does have a right to call out a player for a lack of effort and focus. *Is this not the most ridiculous thing anyone has ever said? UPDATE (01/30/2007, 12:30 PM): I assumed in this post that Jack Wilson spoke with Jose Castillo in the past before he brought his feelings to the media. Jack tells me in today's PG that I guessed correctly.